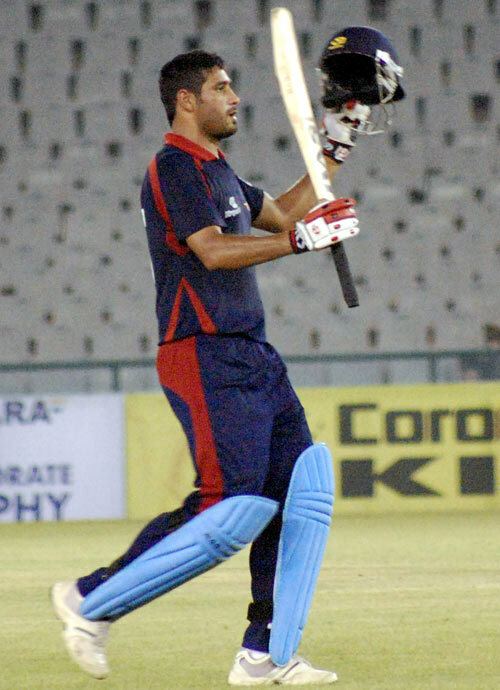 Chandan Madan hit an attractive hundred and Mohammad Kaif chipped in with a serene fifty to power Air India Blue to the final against Air India Red in the BCCI Corporate Trophy. Tata Sports Club bowling wasn't discipline enough to defend 267, which was later readjusted to 246 due to a floodlight failure, against a decent batting line-up on a flat track. Their batting too didn't click initially and it took a breezy fifty from Ajit Agarkar and a quick cameo from Sufiyan Sheikh to push them to a competitive score but it didn't prove enough in the end as Madan led the way with an assured knock. He has just played four List A games so far and there is nothing flattering about the average of 11 and a strike rate of 52.38 but on Sunday, he showcased his potential with a measured innings. He was very strong square on the off side against the seamers, repeatedly threading the field with his punchy square-drives. The highlight of them was a check-drive through covers off Usman Maulvi. And when Ramesh Powar bowled a beauty - a floater that went straight to beat Madan's opening partner Manvinder Bisla in flight and got him stumped - one wondered how Madan would tackle the spinners. The pitch didn't offer much turn and Madan took full toll. He showed good temperament and skill in handling Powar and the left-arm spinners Gaurav Jhatar and Nishit Shetty. He used his feet well, not only charging down the track to play big shots - there was a big six over long-on off Powar and couple of lofted hits to the straight boundary - but also, to smother the turn and collect singles and twos. He found solid company in Kaif, who guided his younger partner with a composed knock. He knew he didn't have to do take any undue risks and went about calmly tucking the ball into gaps. The best shot of his stay was a gorgeous check-drive against the turn through extra cover off Powar and he hurried the end with few feisty hits against Agarkar and Mota. He pulled Agarkar twice, the second of those bringing up his fifty, and walked across the sticks to flick Mota to deep-backward square leg boundary. Madan and Kaif fell within seven balls to cause some artificial excitement towards the end but it only delayed the inevitable. The real hard work was done on the field by Air India Blue's disciplined bowling. RP Singh and Pankaj Singh applied the squeeze in their first spell and the spinners maintained the pressure initially but the bowling fell away in the end to let Tata Sports reach a handy total. It took a whirlwind innings from their captain Agarkar to push them over 250. The seamers tried a few short-pitched deliveries at him which were pulled away for boundaries. Towards the end, he used the long handle to lift full deliveries from the medium-pacer Sachin Rana to the long-on boundary, and once over it, before he pulled Harbhajan Singh over deep midwicket to bring up his fifty. Sufiyan Sheikh took over after Agarkar's exit with a lovely little cameo where he played a series of paddle-scoops against the seamers. The Air India bowling too fell away in the end; RP was either on a length or too short and the spinners too ended up bowling a tad short. It wasn't so at the start when RP and Pankaj troubled the batsmen with their movement. RP got the ball to swing and Pankaj got the ball to seam a bit. It was nothing alarming but it was enough to cause trouble. RP set up Sahil Kukreja with a series of inswingers before he caught the edge with one that went away. Pankaj moved one enough to catch the outer edge of Manoj Joglekar and it took a purposeful innings from Ishank Jaggi and a patient hand from Nishant Shetty to turn the innings around. Jaggi oozed intent, unfurling several on-the-up drives against the seamers. He dealt in singles against the spinners before swinging Harbhajan over long-off to bring up his fifty. However, he fell soon, stumped off the left-arm spinner Sonu Sharma. If Jaggi oozed intent, Shetty showcased solidity. It was a risk-free innings from him, dealing mainly in nudges and dabs; such was his discipline that only when the ball was either overpitched or short, he played an aggressive shot. Agarkar later provided the firepower but on a placid track, without a potent attack, 267 didn't prove enough.